Teddy bear hamsters are adorable, fluffy Syrian hamsters that make delightful pets and terrific moms. Taking good care of your little fur ball during her pregnancy will help her give her babies the best start possible in life, so you can enjoy watching more little balls of fluff run around and get into all kinds of mischief. 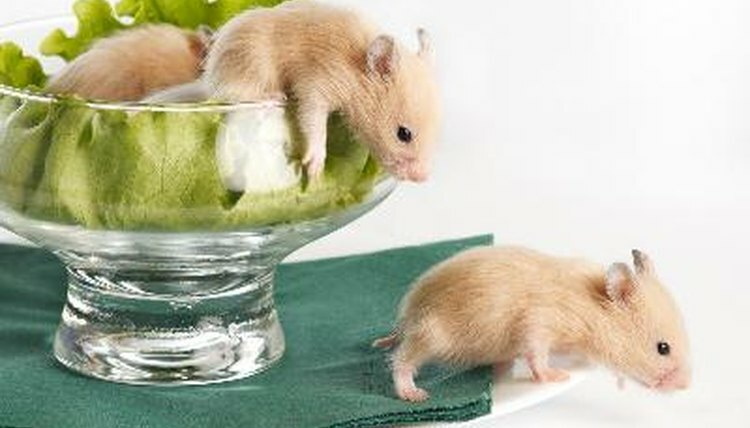 Teddy bear hamsters start showing signs of pregnancy after about 10 days. If you keep an eye on her you might start to see little bumps along her sides that get bigger, showing the babies inside. You might also see tiny pink bumps sticking out through the fur on her belly, showing she is getting ready to nurse her pups. If she starts building a big nest in one corner or gets upset when you try to play with her, she could be pregnant. An aquarium tank setup is the best home for your pregnant girl, because babies can climb out through the sides of wire cages or fall down plastic tubes in modular cages. Clean your mom-to-be's cage as soon as you know she's pregnant, and take her wheel and other toys away. Give her plenty of protein to help her nourish the babies growing inside her, and put extra bedding in her cage so she can build a cozy nest. Your teddy bear hamster will give birth about 16 days after getting pregnant. Leave your hamster alone when she is ready to have her babies so she can relax and give birth in peace when the time is right. Avoid touching the babies and leaving your scent on them after they arrive, because hamster moms might eat their babies if something seems off. If you want to see the babies being born, sit back quietly and watch. You might not see much of your new mom for a few days after she gives birth. Don't worry, she is only nursing her little ones. Avoid touching the babies until they are at least 14 days old. Fill their bowl with small bird seed, picking out larger pieces like sunflower seeds that they aren't ready for yet. Clean the cage after a couple of weeks to give everyone a fresh-smelling home.